Traps are culturally almost universal and seem to have been independently invented many times. There are essentially two types of trap, a permanent or semi-permanent structure placed in a river or tidal area and bottle or pot trap that are usually, but not always baited to attract prey, and are periodically lifted out of the water. The Mediterranean sea has been described as the world's largest fish trap. Basic bottle trap Bottle traps are also known as pot traps. 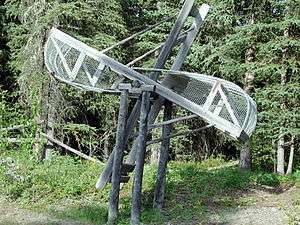 This type of trap is portable, and is used to catch small fish and other small aquatic animals. It consists of a container shaped somewhat like a bottle, usually with an inverted funnel at the entrance. It can be constructed from a plastic bottle, or a glass jar or earthenware pot, or woven with wire or flax. The trap is lowered into the water on a line, where it is left either at the bottom, or suspended at some depth beneath the surface. Bait is usually, but not always used to lure the prey inside. Variants of this basic trap have been used from early times in countries around the world. Crab trap Different types of crab traps are used depending on regional preferences, the type of crab targeted and the underwater topography. Typically, they are constructed as wire cages, as shown in the image. Eel trap Traditionally, eel traps were widespread, and have been invented independently around the word. The New Zealand Māori wove intricate eel pots they called hīnaki from the stems of climbing plants. At their best, these were works of art. Fyke net A fyke net is made from a bag-shaped net held open by hoops. These can be linked together in long chains, and are used to catch eels in rivers. Fyke nets equipped with wings and leaders are used in sheltered places in lakes where there is plenty of plant life. Hundreds of these nets can be connected into systems where it is not practical to build large fixed structures. Katiska trap A katiska is a portable fish trap used in Finland. It is a lightweight and made from chicken wire. The trap can either be collapsible or rigid, and is easily placed at any depth since it needs no anchoring. Katiska are commonly used in hobby fishing, since they catch only a small number of fish. 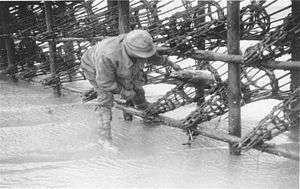 The photo shows a fisherman checking a katiska. Lobster pot A lobster pot is a portable trap used to trap lobsters or crayfish. An opening permits the lobster to enter a tunnel of netting. Lobster pots are usually constructed in two parts from wire and wood. The lobster enters the first part, called the "chamber" or "kitchen", where there is bait. It then moves into the "parlour", where it is trapped. Lobster pots can hold several lobsters. They are usually dropped to the sea floor about a dozen at a time, and are marked by a buoy so they can be picked up later. Octopus trap In Japan, the Mediterranean, and other regions, an ancient variant is used to catch octopuses. They are usually heavy earthenware pots, and do not have an inverted funnel. These traps are left on the sea floor for days at a time. Octopuses enter and remain inside, using the pot as shelter and protection. No bait is used. When the pot is raised, the octopus will not normally try to escape. trap In Haikou, China, local people make bottle traps with small, glass jars. Local craftspeople produce a variant made from a two-litre soda bottle. This type has an inverted funnel made by cutting off the top of the bottle a few centimetres down the neck, and making vertical cuts downward. This produces tabs which are then be pushed inward, producing the inverted funnel shape. A stone is attached to the side of the bottle, and several meters of line are provided. Numerous holes are drilled through the bottle to allow water to enter and escape. These are sold by the seaside for 6 yuan, along with a small bag of flour for bait. Stickleback trap The stickleback trap is a variant of the soda bottle trap. Almadraba Almadraba is an ancient Andalusian way of catching tuna. It is an elaborate way of setting nets in a maze that leads to a central killing pool. 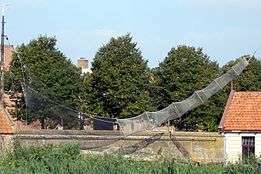 In Sicily the mazes of nets, and also the places where the nets are set are called Tonnara, and the overall method of capturing the fishes is called Mattanza. This takes place during spring and the beginning of summer when tuna tend to go into the Mediterranean. of stacked stones The Double-heart of stacked stones is a stone weir located on the north side of Cimei, an island in the Penghu archipelago to the west of Taiwan. 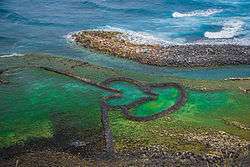 It is a well-preserved ancient fish trap made by stacking stones to form a trap that resembles a flying heart. Fishing weir A fishing weir is an obstruction placed in tidal waters or wholly or partially across a river, which is designed to hinder the passage of fish. Traditionally they were built from wood or stones. Fish such as salmon can be trapped when they attempt to swim upstream, other fish such as eels can be trapped when they attempt to migrate downstream. 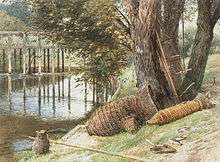 As fish traps, fishing weirs date back to the Bronze Age in Sweden and to Roman times in the UK. They were used by native North Americans and early settlers to catch fish for trade and to feed their communities. Fish wheel A fish wheel is a device for catching fish which operates much as a water-powered mill wheel. A wheel complete with baskets and paddles is attached to a floating dock. The wheel rotates due to the current of the stream it is placed into. 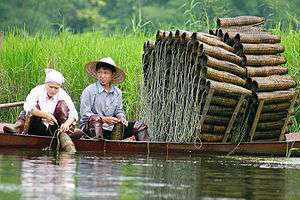 The baskets on the wheel capture fish traveling upstream. The fish caught in the baskets fall into a holding tank. When the holding tank is full, the fish are removed. Putcher Putcher traps are ancient traps used for catching salmon. They are peculiar to the River Severn in Great Britain. A putcher is a conical-shaped basket about five feet long. A number of putchers are tied together in rows standing four or five feet high to form a "rank". The rank is set against the incoming or outgoing tide. Traditionally putchers were made of hazel rods with willow plait. More modern baskets can use steel or aluminium wire. Trabucco A trabucco is a shore-operated lift net, a platform anchored to rocks by large logs of Aleppo pine. 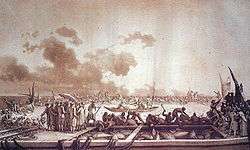 Two or more long wooden arms jut out into the sea, where they suspend a narrow-meshed net some feet above the water. They are found along the coast of Gargano, where they are protected as historical monuments. Another variant is found along the coasts of Abruzzo and Molise, where they are installed in shallower waters, and use a platform which runs parallel to the coast instead of jutting out into the water. Wagenya trap The Wagenya people, in the Congo, build a huge system of wooden tripods across the river. These tripods are anchored on the holes naturally carved in the rock by the water current. To these tripods are anchored large baskets, which are lowered in the rapids to "sieve" the waters for fish. The baskets are designed and sized to trap only large fish. The Wagenya lift the baskets twice daily to check for fish, which are retrieved by swimmers.